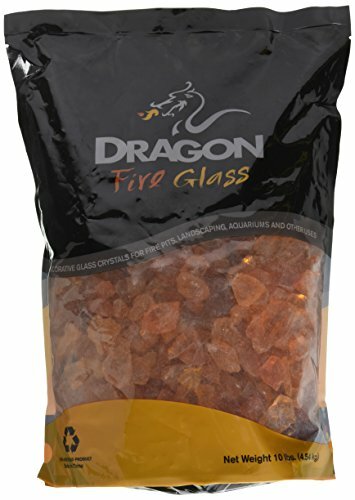 Dragon Glass 10lb. Orange Landscape Glass 1/2"
Dragon Glass Landscape Fire Glass is ideal for landscapes and for use in propane and natural gas fire applications. All glass pieces are tumbled to produce smooth edges for landscaping while also tempered to withstand high temperatures. These glass pieces are created through an industry - leading manufacturing process to ensure each piece will maintain form and color for years to highlight all indoor and outdoor environments. The glass is complimented by a bag designed for easy handling to apply and store for all sized projects. Half-inch landscape glass is recommended over quarter-inch landscape glass for propane and natural gas fire applications. Feature decorative tumbled glass for fire pits, landscapes, aquariums, floral arrangements, water features, and to embed in decorative mosaics and stone works to impress all with its durability charm and decor. Landscape Glass is not recommended material for use in fire places. If you have any questions about this product by Dragon Glass, contact us by completing and submitting the form below. If you are looking for a specif part number, please include it with your message.